Work and work out with a pedal machine. Circulation is the ability of your heart and blood vessels to work together to pump oxygen and other nutrients throughout your body. Without proper circulation, your limbs can feel cold, tingly or numb, especially in your hands and feet. A sedentary lifestyle contributes to poor circulation. You can remedy this situation by stowing a pedaling machine under your desk; this machine allows you to be more active and improve your circulation, even while getting work done. Portable pedal machines are basically bike pedals on a stand. Unlike stationary bikes, many styles of pedal machines are placed on the floor in front of you as you sit in your chair of choice. They can be hidden under your desk, allowing you to pedal away as you work. 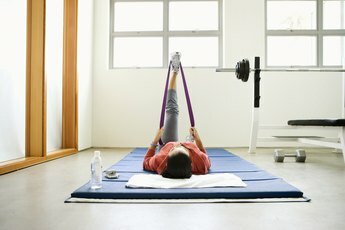 In 2012, “The British Journal of Sports Medicine” published a study that suggests pedal machines are useful in increasing the amount of activity in the workplace. The study found that participants pedaled around 23 minutes per workday. If you did the same, you would be well on your way to meeting the suggested 30 minutes of exercise per day. When you are performing cardiovascular exercises, such as running, swimming and cycling, your body requires more oxygen to function properly. You breathe harder to take in more oxygen, and your heart pumps harder and faster in order to transport the oxygen and other nutrients through your body quicker. As your blood rushes to all parts of your body, you can feel the rise in temperature and see your skin flush, indicating an increase in circulation. Even if you already get regular exercise but spend the rest of your day sitting, your circulation can suffer. Health experts recommend breaking up long periods of sitting with a few minutes of activity. You can stand up to clean your desk or take out the trash or pedal away at the cycling machine under your desk. Worksite wellness specialists and other public health experts strive to promote healthy workplace environments for both the health of employees and to keep health costs down for both employers and employees. If your workplace doesn’t supply you with a pedal machine already, or if your boss is reluctant to allow you to bring one, reassure her that a pedal machine is discreet, beneficial to your health, and cost-effective for the company. 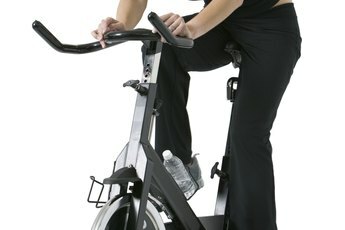 Does Riding an Exercise Bike Improve Circulation? What Workout Machines Can Help Flatten Your Stomach Fast? Can You Trim Your Waist While Sitting?